Clear all filters & start overIf no courses are currently scheduled, please contact St John on 1300 St John for further info. *Unique Student Identifier - If you are undertaking nationally recognised training delivered by a Registered Training Organisation you will need to have a Unique Student Identifier (USI) number. For information on the USI, or to create a new USI Click here. Thank you for your booking, one of our admin team will contact you shortly. The trainer of my course made everyone in the class feel very comfortable, which translated into confidence - not something that all instructors possess. Brilliant presentation, informative and attention to course content Chris endeavoured to provide knowledge so that we were strengthened should we have a situation that we need to apply these skills. Far superior to the first course I attended. Our First Aid training included a diverse mixture of Indigenous and non-indigenous, professionals and non-professionals of both categories and male and female. Regina managed to engage each and every one of us and developed a group and yet individual relationship with us all. She has a remarkable ability to read and relate to people individually and as a group! Thank you so much for coming yesterday. It was definitely the highlight of my kids day. One staff member mentioned that she heard a buzz in the courtyard during one of the breaks and the conversation was all about first aid! Your energetic, practical and relevant training workshops, across all levels in our school, were greatly appreciated by staff and students. The information was light-hearted enough to make everyone feel welcome but serious enough to get all the necessary information to sink in. Bravo. I just want to acknowledge the fantastic workshop presented by Ivan at our school. We learnt many new pieces of information that were important for our setting. He was supportive as we practiced the use of the AED while performing CPR. On behalf of the staff and students of Ti Tree School I would like to thank the St John Ambulance First Aid in Schools Program… We look forward to being a part of this great program in the future. Just letting you know that we found Daniel to be an excellent trainer. His experience and background on Goulburn Island meant that he related well to the participants and understood our needs. It was a pleasure working with you. Our First Aid Trainer managed to remain flexible and versatile when it came to the space and the special needs of the participants without compromising the standard of training. There was good humour and fun and he very patiently answered questions and repeated information as required. We feel better prepared to handle a crisis which hopefully will not occur! The students and staff thought our trainer was brilliant! Cannot speak any more highly of her, even the staff rated her as the best First Aid Trainer they had encountered! I would like to send a very big appreciation to our First Aid trainer for her great knowledge and efforts in helping the women complete their course. The ladies all went away with something they can remember from your teachings of first aid. So thank you once again. 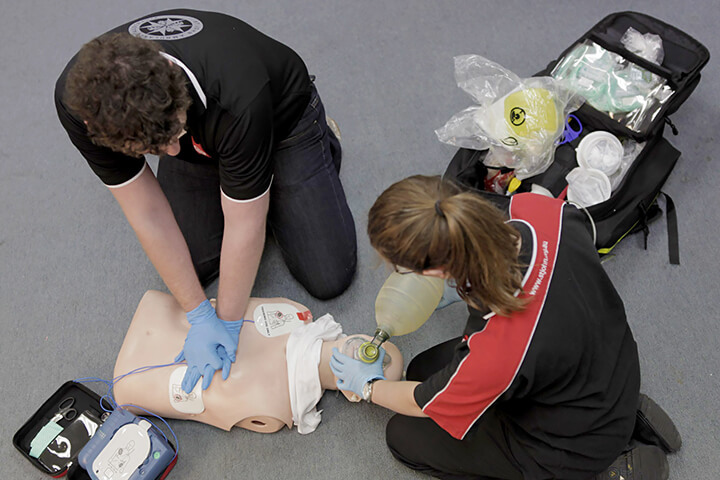 Copyright ©2019 All rights reserved | St John Ambulance Australia (NT) Inc.